Despite the success Fallon has had with his main band, Gaslight Anthem, an act who started out in Jersey basements and slowly built their way up to headlining New York’s Radio City Music Hall and sharing the stage with Bruce Springsteen, he’s always loved decidedly less rocking acts such as the Afghan Whigs and Tom Waits. The Horrible Crowes—his new side-project alongside longtime friend and guitar tech Ian Perkins—is his lounge-friendly tip of the hat to the acts who have shaped another side of his musical vision. 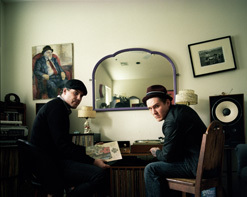 The band recorded their debut album Elsie with the help of Ted Hutt (Dropkick Murphys, Chuck Ragan)—and although the band is technically a two-piece, they also enlisted Steve Sidelnyk (drums and percussion), the Parkington Sisters (strings and accordion), Ted Hutt (guitars), Adele Jensen (trumpet) and The Gaslight Anthem’s other members to add more texture to the sound of the album. The Horrible Crowes leaves a bit of the Springsteen bravado of Gaslight to embrace strings and drum loops over actual instrumentation to create a unique dichotomy between organic and electronic instrumentation that prevents Elsie from lapsing into familiar territory. Although critics usually shy away from change, Elsie is already scoring some serious praise. AbsolutePunk have given the record a 10/10, stating “it’s just that good,” with Jason Tate himself naming this Fallon’s “opus.” SPIN has also given The Horrible Crowes great admiration, stepping away from their usual pattern disdain for any side-projects. The band has recently taken over the Rolling Stone website, streaming their entire album for fans to check out. The Horrible Crowes will be taking their masterpiece on the road this fall season, starting with a UK run. We should expect to see some dates in the US before Fallon returns to Gaslight Anthem, so stay tuned! The video finds the members of the group completely out of the picture. This clip is, instead, focused on a man recovering from a breakdown and drug addiction. The camera follows him around some very desolate locations as he battles his inner demons, that we actually get to see! The whole thing concludes with the subject in a one on one match with his dark spirit in a final showdown. We’ll let you discover how it all ends, but we will say that this video will be a totally different beast than what you have come to expect from the Gaslight camp. We’re thrilled to be working with the SideOneDummy crew once again on this unique project. We’ve got all sort of things from The Horrible Crowes here at the office, including copies of the awesome Elsie, so please be in touch if we can hook you up! If you need more info, call Andy Gesner at 732-613-1779 or e-mail us at HIPVideo@aol.com. You can also visitwww.SideOneDummy.com and www.TheHorribleCrowes.com to find out more about The Horrible Crowes and tour dates near you.